Africa’s largest airline group, Ethiopian Airlines, proudly announces that it has decided to start its flight to Abuja Airport with its latest technology and the most modern Airplane in the world, the Airbus A350-900. The state of the art airplane will start the scheduled service on the Addis Ababa Abuja route, thereby gracing the reopening of Abuja Airport, to be held on April 18, 2017. Following this move Ethiopian Group CEO, Mr. Tewolde GebreMariam, remarked; “As a veteran Pan African airline, it has always been our source of pride o connect our beloved continent Africa together and beyond. Our presence in Nigeria dates back to the 1960’s, same time the Federal Republic of Nigeria got independence from foreign colonization. We have always given our best to Nigeria at all times, both at good and challenging times, and we have been part of Nigeria’s historic growth and always consider ourselves as vital partners in the history and growth of Nigeria as a country. The A350 is yet one of the landmarks in our 70 years proud history; providing exceptional levels of luxury and reliability for a totally unique passenger experience. Hence, with the reopening of Abuja Airport, the extra features of our game changing fleet, Airbus A350, will be awaiting for our esteemed Nigerian travellers. We shall continue to avail critical air connectivity options and connect African countries together and far beyond.” Ethiopian currently operates 20 weekly flights to four Nigerian cities; Lagos, Abuja, Enugu and Kano; offering hassle free connectivity to its worldwide network spread in five continents. Passengers aboard the flight will enjoy the extra features of this latest flying machine: amazing cabin interior features with the latest high-definition touchscreen, personal monitors with a higher selection of movies, wider seats and windows, the lowest twin engine noise level, advanced air conditioning technology, full LED mood lighting. It is to be recalled that Ethiopian has been the first in Africa to own and operate the A350 in African skies. Among a total of 14 orders, Ethiopian currently has three of them in operation. Ethiopian commands the lion’s share of the pan-African passenger and cargo network operating the youngest and most modern fleet to 95 international destinations across five continents. 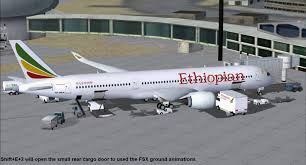 Ethiopian fleet includes ultra-modern and environmentally friendly aircraft such as Airbus A350, Boeing 787, Boeing 777-300ER, Boeing 777-200LR, Boeing 777-200 Freighter, Bombardier Q-400 double cabin with an average fleet age of five years. In fact, Ethiopian is the first airline in Africa to own and operate these aircraft. Ethiopian is currently implementing a 15-year strategic plan called Vision 2025 that will see it become the leading aviation group in Africa with seven business centers: Ethiopian Domestic and Regional Airline; Ethiopian International Passenger Airline; Ethiopian Cargo; Ethiopian MRO; Ethiopian Aviation Academy; Ethiopian In-flight Catering Services; and Ethiopian Ground Service. Ethiopian is a multi-award winning airline registering an average growth of 25% in the past seven years.